Anyone who reads this blog knows that I'm a sucker for historicals! I'm a sucker for history too. Especially any type of history that involves the glamorous existence of balls, masques, and a chance to hide who you really are. 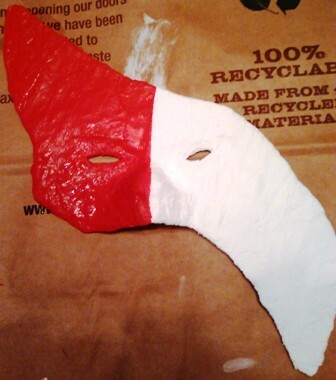 Then I was granted a unique opportunity: create a Mardi Gras mask! More like decorate one to celebrate the holiday at the day job. The reward is a chance to win a cash prize, but the true reward is accomplishing something creative with my hands. 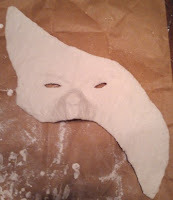 So I embarked on the scary journey of creating a mask! I didn't want to just decorate the flimsy piece of plastic I'd been provided. No, my inner regency romance lovin' side took over. Next thing I knew I was watching YouTube videos and asking Twitter for help. After a late afternoon stop at the Hobby Lobby, much to the disappointment of my son (he thought we were going to a toy store), my creative project launched. For your viewing pleasure I'll share my steps and the not-so-pretty photos that go with it! Step 1: The mask. $1.00 and you have something flimsy and flaking at the edges. 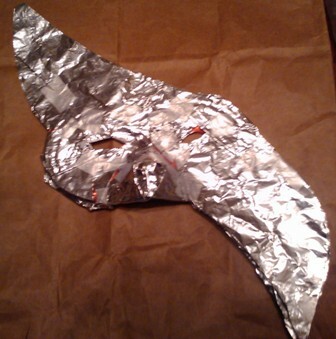 Step 2: Aluminum foil! I layered two sheets of aluminum foil on top of one another. A little tape, some cutting with scissors, and more folding and you get your design. Daughter: "Mommy that looks scary!" Step 4: Spruce that bad boy up with some color! I used acrylics for this project, and then let the mask dry overnight. Hubby: "It looks like a misshapen Batman Batarang!" Step 5: Decorate it! You can use just about anything with a hot glue gun. I used a ton of stickers that were designed for scrap booking but they looked so awesome! 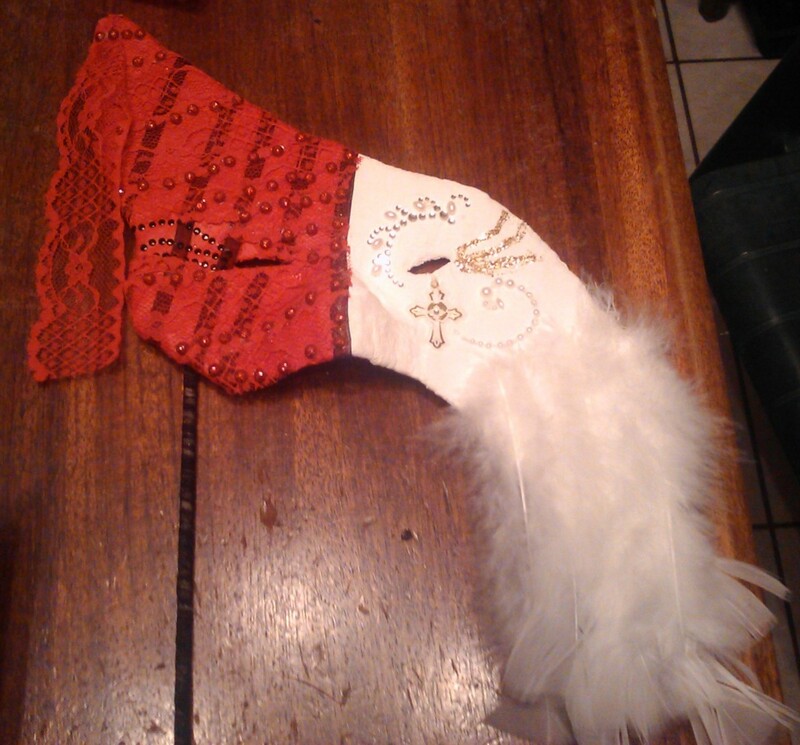 A few feathers, some lace, and a little glitter glue. If you're into fabrics then you can use those as well or whatever floats your boat. I definitely recommend a hot glue gun! I love the thing for projects. And wa la! Now commenter's my questions: What was my theme for the mask? 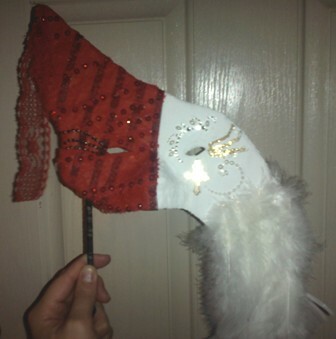 Do you love masked parties? Oooh pretties! I've never made a mask before (and am duly impressed by how you created this one! ), but I am a huge fan a costume parties. I will dress up in costume anytime, anywhere. Theme guess: Angels and Devils (I bet I don't win, but if I do, please use the $10 to buy more books to review! They don't even have to be ours-LOL).